We won't go into great detail on describing Camel other than it is the open source integration framework based on Enterprise Integration Patterns. Apache Camel uses URIs to work directly with any kind of Transport or messaging model such as HTTP,ActiveMQ, JMS, JBI, SCA, MINA or CXF, as well as pluggable Components and Data Format options. 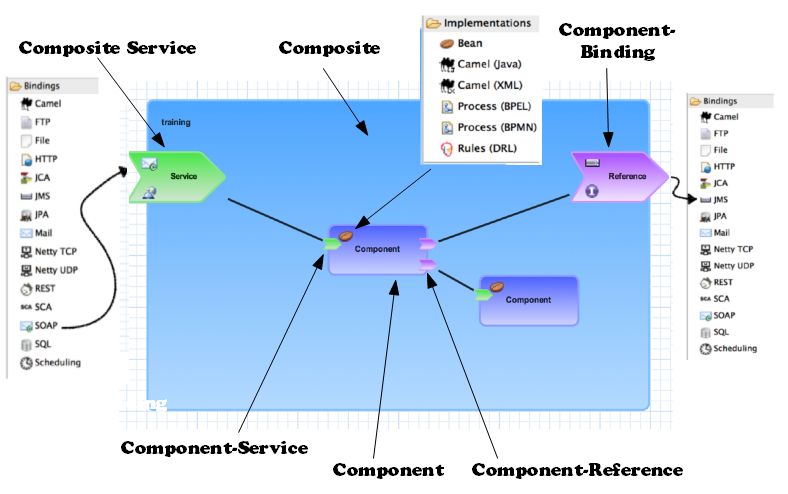 One of these components is the sap-netweaver component available in Camel 2.12 which will be available in Fuse 6.1. 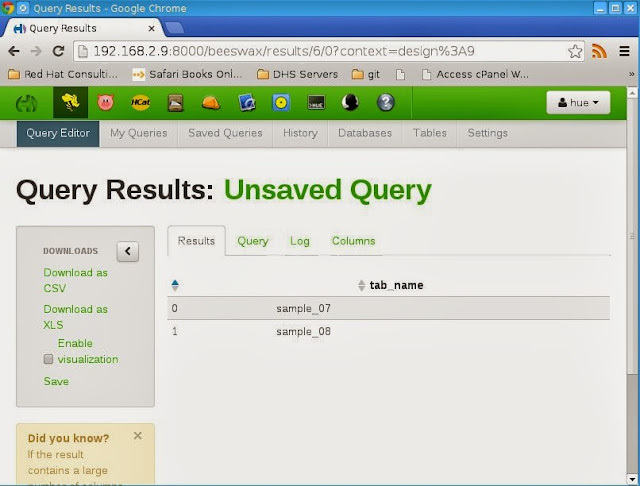 In this blog we show how to use the sap-netweaver component in Fuse. [pache.camel.spring.Main.main()] SpringCamelContext INFO Total 1 routes, of which 1 is started. The Travel Triage Reference Implementation v1.0 shows the integration of Red Hat JBoss Data Virtualization, Red Hat JBoss Fuse, SAP NetWeaver Gateway and MySQL. 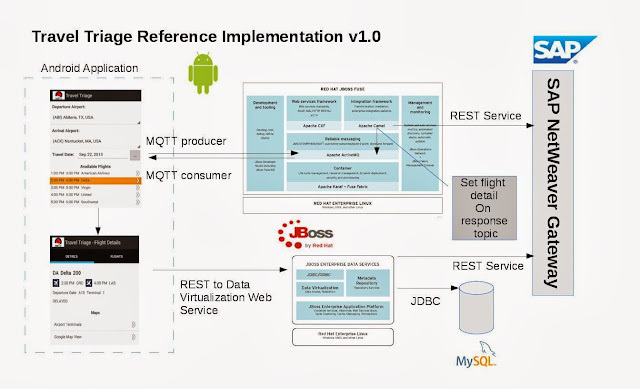 The Android application communicates with Fuse through MQTT and with Data Virtualization through REST. JBoss Fuse is composed of several community projects - Apache ActiveMQ, Apache CXF, Apache Karaf and Apache Camel. We will highlight Apache ActiveMQ and Apache Camel. Apache Camel is a integration framework based on Enterprise Integration Patterns. Camel allows you to define routing and mediation rules in a variety of domain-specific languages (DSL). Camel exposed many component implementations via Uniform Resource Identifier (URI). One of those components are the SAP NetWeaver Gateway component. The sap-netweaver componenet integrates with the SAP NetWeaver Gateway using HTTP transports. In this demonstration the camel route with the Spring DSL to get a command from a file, use it with the sap-netweaver component and then use the results. 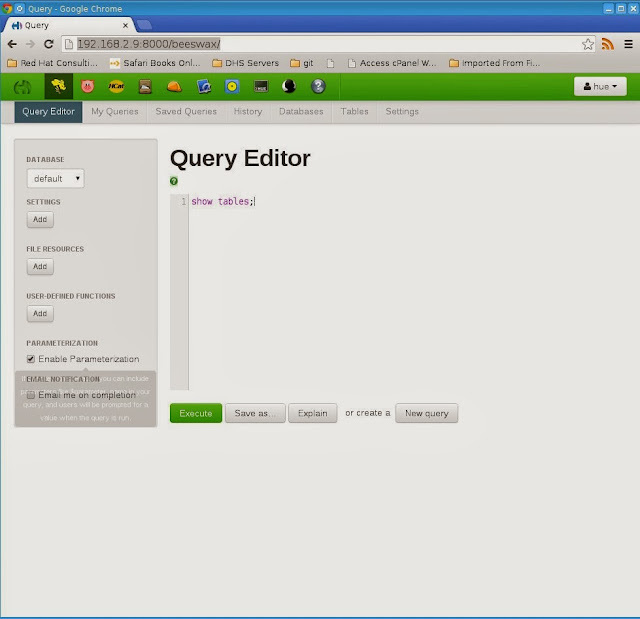 Apache ActiveMQ is the open source messageing and integration pattern server. ActiveMQ supports a variety of Cross Language Clients and protocols. 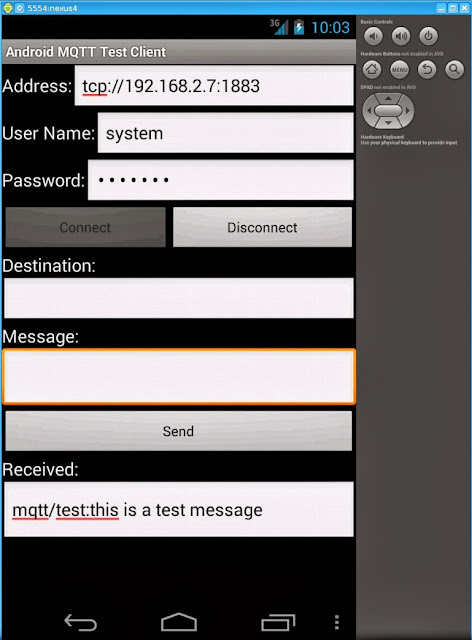 In this demonstration we are using the MQTT protocol. MQTT is a lightweight machine-to-machine ([email protected]) publish and subscribe messaging protocol. 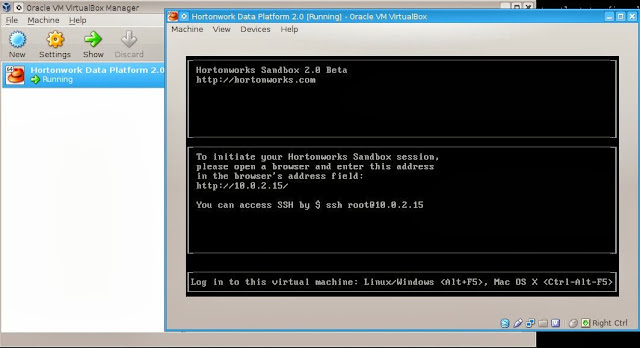 Data Virtualization allows applications to use data from multiple, heterogenous data stores. Through abstraction and federation, the data is accessed and integrated in real-time across distributed data sources copying or moving data from its system of record. Teiid is the community project that is the basis for Data Virtualization. In our demonstration we are using MySQL and SAP NetWeaver Gateway as the datasources and expose them as one datasource to the application. Red Hat introduces a new way to integrate your services, applications, and data. Join our webinar for a demonstration of the next version of Red Hat JBoss SOA Platform’s features and functionality. Want to create simple and flexible services that hide the complexity of integrating with different enterprise applications? A service-oriented architecture (SOA) platform can enable faster and easier mobile, cloud, and business process management (BPM) projects in your organization. Attend this webinar to understand the new capabilities in the upcoming version of the JBoss SOA Platform, Red Hat's middleware solution for application integration, messaging, SOA, and service governance requirements. 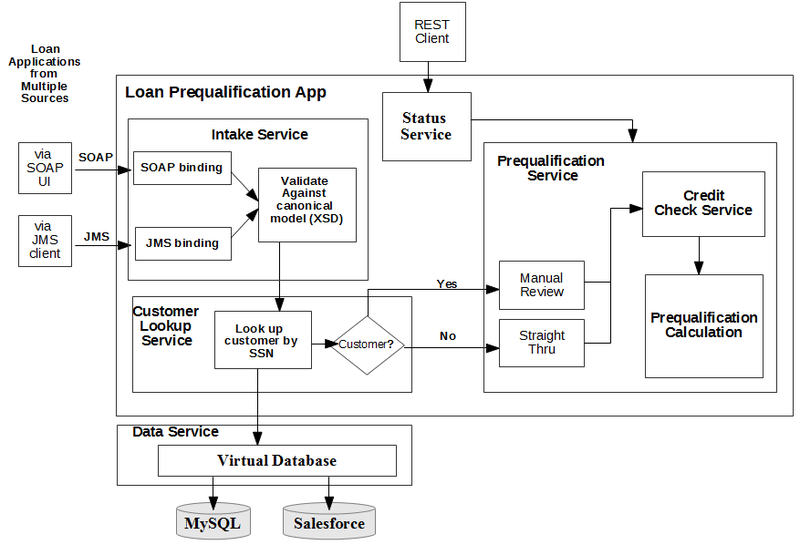 The structure and layout of an application on the next version of the JBoss SOA Platform. How to implement service logic and configure service bindings. Deploying the application to the platform. Join us at Hadoop World in NY October 28-31! A demonstration of Red Hat JBoss Data Virtualization with Hive/Hadoop will be shown at the Red Hat booth. 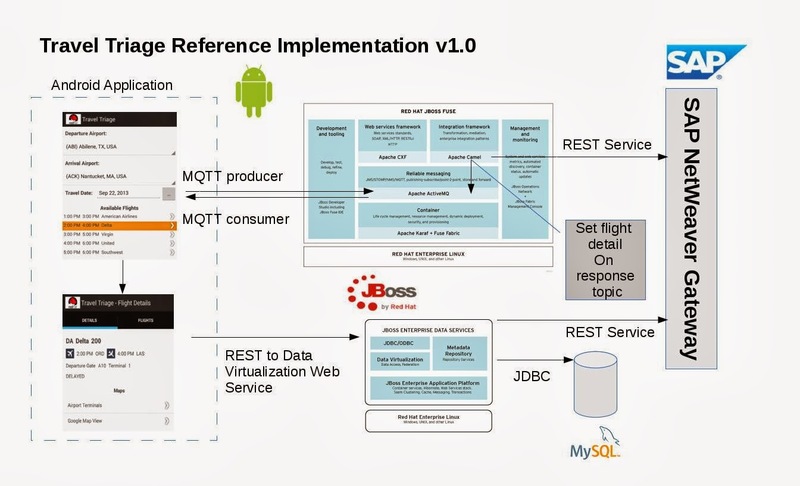 How to be a JBoss A-MQ and Android Rock Star in the world of the Internet of Things! I wanted to pull together a simple example of how to leverage Red Hat JBoss A-MQ in the Internet of Things (IoT) through the use of Message Queue Telemetry Transport (MQTT) in Android. The first part of the article will highlight the concepts and technologies used in the demonstration. The second part will get you up and running with an example in a couple of minutes just like a rock star. The example shows how easy it is to publish and subscribe to a topic in JBoss A-MQ from Android using the MQTT Client. What is Red Hat JBoss A-MQ? A small footprint, high performance, open source messaging platform based on Apache ActiveMQ. Under the Red Hat Developer program the JBoss A-MQ Enterprise software is available for developers to try, FOR FREE! What supporting projects are included in the demonstration? 1. The transport connector for mqtt. The standard port is 1883. 2. To enable security we just use the SimpleAuthenticationPlugin. The main code in the Android app is in the MQTTActivity.java file in the org.example.mqtt package. The android app UI is in the main.xml and can be seen in the graphical layout. 2. Download Red Hat JBoss A-MQ from https://www.jboss.org/products/amq.html and place in the installs directory. 3. Download the Android Bundle from http://developer.android.com/sdk/index.html and unzip. 4. 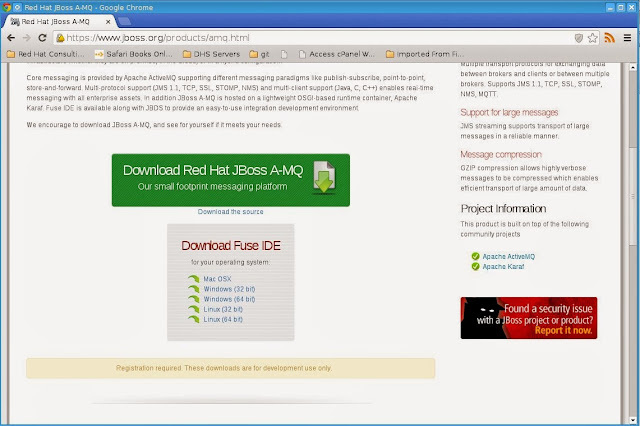 Download and start JBoss Developer Studio 7 or the Fuse IDE. 6. 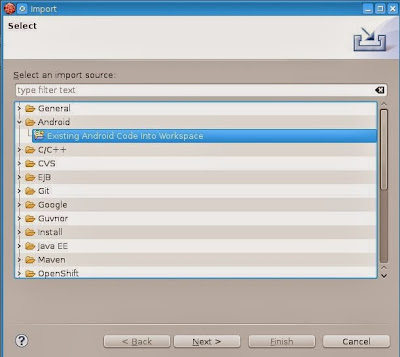 Create a Android Virtual Device (AVD) through JBDS in the Android Virtual Device Manager in the Window menu. If the Android Virtual Device Manager does not show on the Window menu then Click on Window > Customize perspective > Command Groups Availability tab. 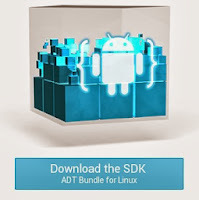 Check the "Android SDK and AVD Manager" option and hit the OK button. 10. Right click on AndroidManifest.xml and Run As Android. 13. The message will sent to the topic, read from the topic and then placed in the received field. Submit your papers for Red Hat Summit 2014 in San Francisco, CA!